"Street of the Knights is one of the Rhodes sights that simply cannot be compared to anything else in the world." There are so many things to do and see in Rhodes, but this list of top five Rhodes sights will help every Europe cruise guest check the most important ones off their list. 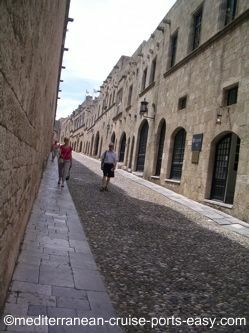 Street of the Knights is one of the Rhodes sights that simply cannot be compared to anything else in the world. You might have seen medieval towns before, seen medieval structures, but there is no place that conveys the essence of medieval times so strongly as this one. Walking the Street of the Knights almost feels like being sucked up into a time warp. With almost no visible signs of the 21st Century along this street, it is easy to believe you stepped into a different time. The impenetrable stone facades of this fascinating street still seem to hide secrets of the Knights of St. John who built it in the 15th and 16th Centuries. The street is lined with buildings that were used as inns for important guests, officers and “Holy warriors” on their way to or from Constantinople. 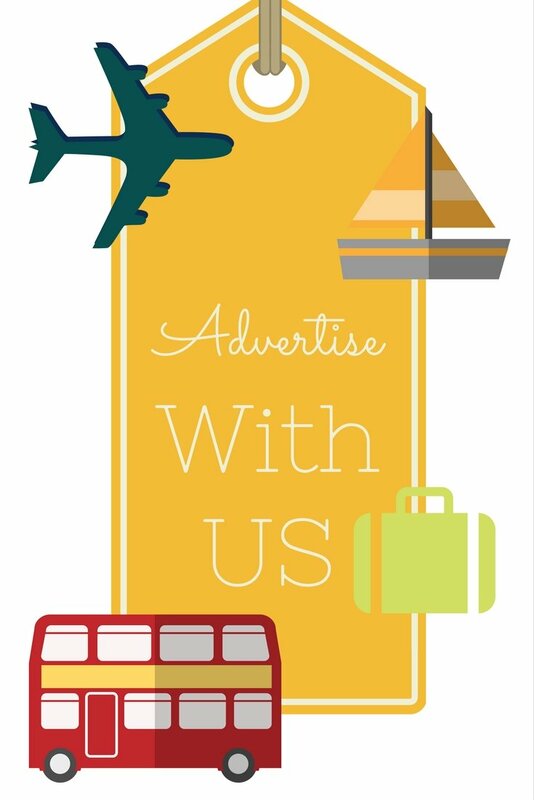 For more on Street of the Knights read our article Rhodes knights. 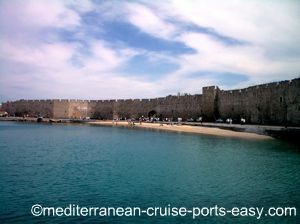 Situated on top of a hill above the harbor, the Palace dominates the old town, and all the Rhodes sights in it. It was built on the spot where the temple of the god Helios used to stand in antiquity, as well as a Byzantine fortress later on. The palace was built in its final form in the 14th Century by the Rhodes Knights of St John, and it was used as the residence of the Grand Master, head of the Order. Most of its structure was destroyed after years of Turkish occupation and then finally in the 19th Century by a big gunpowder magazine explosion. After its restoration, that took place between 1937 and 1940, many original elements that had stood there for over 2000 years disappeared. Still, the result is quite impressive and The Palace is one of the Rhodes sights that simply cannot be missed by any Mediterranean cruisers. 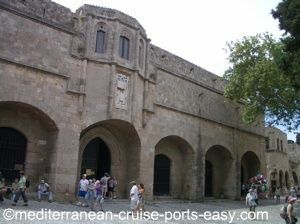 On how to reach the Palace of the Grand Master, one of the must see Rhodes sights, read our article Palace of the Grand Master. You cannot miss seeing the Rhodes city walls. 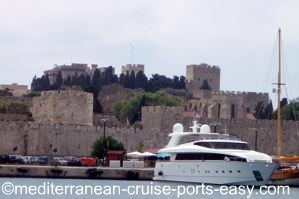 They are the first of the Rhodes sights you will spot, even from far away, as your cruise ship pulls into the commercial port of Rhodes. This impressive 4 km long work of military-architecture encompasses the Old Town of Rhodes. It is a perfect welcome for all history aficionados as well as a mouth-watering taste of other Rhodes sights to come inside. This stunning defensive complex is a result of work that took place in various time periods, most of it was done by the Rhodes Knights of St. John in the 14th and 15th Centuries. It’s interesting that different phases of the wall can be easily dated due to the various coats of arms of the Grand Masters during their different periods of office. The walls were mostly built at the time when the use of cannons became common in warfare. That’s why the wall’s major feature is not height but thickness, to withstand cannon fire. To make them even more impenetrable, the walls were often reinforced with ramparts that were used as first in line of fire. A wide deep ditch around the wall with a high outer dike never contained water. Its role was merely to trap the enemy. Walking on this, one of the Rhodes sights, is not permitted but you can easily walk along the outer ditch. There are a few different gates in the Rhodes walls, both from the sea and land and they will make for some impressive photos to show when you return home after your Mediterranean cruise! 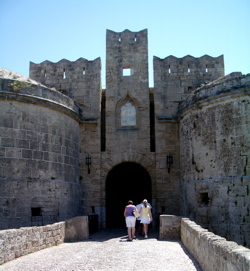 Just like many other must see Rhodes sights, this museum is placed in one of the buildings built by the Rhodes Knights of St. John – the hospital. This two-floor building with an internal yard was built in the 15th Century. You will easily recognize its façade by 8 arched openings on the lower floor, which were used as store rooms. Before heading to the upper floor where the museum is, walk around the square courtyard bordered with shady vaulted loggias. 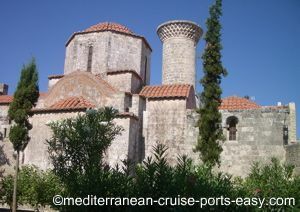 To find out what you can expect to see in the museum read our article Rhodes museums. All the above-mentioned Rhodes attractions may be the shiny stars of Rhodes old town, but you could never get its complexity and beauty without paying attention to the Byzantine, Muslim and Jewish monuments scattered throughout the town. In Rhodes it is very common to see how one culture changes the appearance and purpose of one building to suit its own needs. Often times you will see Byzantine churches turned into Roman Catholic cathedrals turned into Ottoman mosques… and then back again. To enjoy the spirit of this multi-faceted town, get lost in the little streets of the Jewish and Muslim quarter and have your camera ready, you’re in for a treat! To find out more about Jewish Rhodes read our article on Rhodes Museums.